Cyprus wasn't all rocks and hard work. Some time was spent in normal touristy sort of things. Swimming in the Mediterranean, drinking numerous metrios (Cypriot coffee - this should be introduced to New Zealand some time! ), shopping and general sightseeing. This page will grow as extra pictures are processed. The shot on the left is from our Emirates Airways Boing 777 as it approached Dubai in the early morning. Our stay in Dubai was brief, just 10 hours. 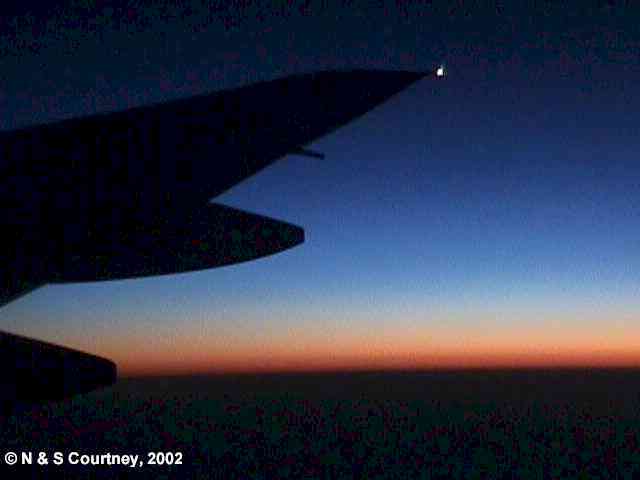 In that time, we managed to catch up on some sleep, and a few of the time zones that we had been through on our journey from Auckland, New Zealand, via Melbourne, Australia, where we stopped off for lunch with friends, and then on to Dubai. Also time to visit the gold sook to buy a gold chain (I've never seen so much gold in one place before! ), and a tour of the local sights courtesy of a local taxi driver. 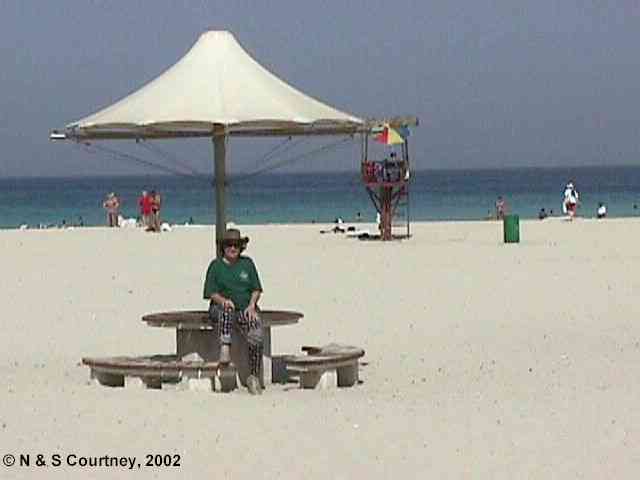 The beach depicted at left was blindingly white, and only sparsely populated. Our flight on the Emirates Boing 777 was very smooth and relaxing. Cute little TV screens in the backs of each seat. I wonder how long before this is standard an all airlines? On our return journey three weeks later, at 3am in the morning, the temperature was 36oC, with 100% humidity! This was definitely a shock to the system, but no one else seemed to notice it! While in Paphos, we took a little time out to visit the Roman mosaics in the village of Nea Paphos, that is still in the process of being excavated. 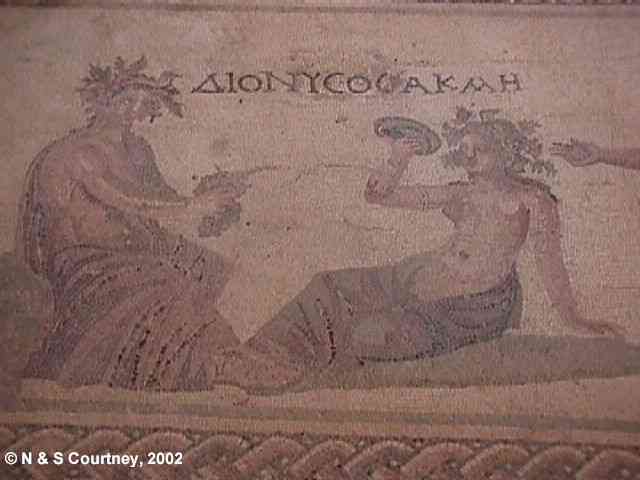 In the House of Dionysos, this mosaic is a depiction of Dionysos, God of wine, himself, and of the nymph Akme, seated opposite him drinking wine out of a bowl. Dionysos is offering a bunch of grapes. These mosaics are not to be missed when visiting Paphos. The house appears to have been built at the end of the 2nd century A.D., and to have been destroyed and abandoned after a series of earthquakes that ruined Paphos and most other towns in Cyprus in the first half of the 4th century A.D.